A couple of days before the Gatsby event this past week, Mena and I were emailing each other our plans for the event. Believe it or not, I was chosen to make dessert. 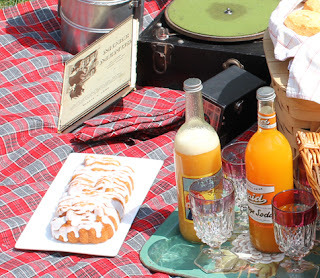 ;) I actually did a little bit of homework, trying to find a dessert that would be period appropriate for the picnic. 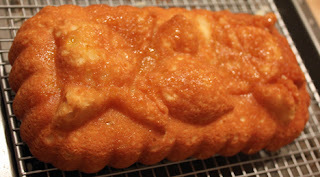 Pound cake seemed to fit into the time, and Goodies by Anna had just post a summer-y lemon pound cake recipe. Just in time! Start by spraying a 12 cup Bundt pan with Pam for Baking (or you can butter and flour the pan). Set aside. Note: I used a regular sized bundt pan, and a lemon-designed loaf pan. It was the perfect amount of batter for both. So if you don't have a larger pan, you can split it between the two. I think it would have also fit into two regular size loaf pans. Cake Batter: In a large bowl, whisk together the flour, baking powder, baking soda and salt. Set aside. In the bowl of an electric mixer fitted with the paddle attachment beat the butter and sugar until fluffly. Beat in the eggs one at a time until incorporated. Beat in the extracts and the zest. On low speed add the flour alternating with the sour cream, in three additions. Beat in the lemon juice until batter is smooth. Spread batter evenly in pan and bake for 1 to 1 1/4 hours until a wood skewer inserted in the center of cake comes out clean. Lemon Simple Syrup: While cake is baking, combine lemon juice, sugar, water, zest and lemon extract in a small sauce pan set over medium high heat. Bring mixture a boil and cook until reduced down to approximately 1/2 cup of syrup, around 15 minutes. 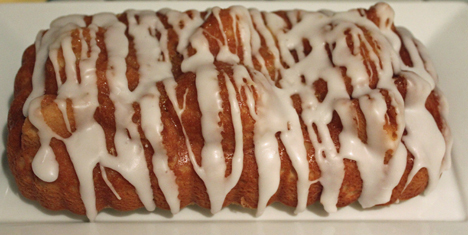 Let syrup cool before brushing onto warm cake. Assembly: Poke holes into cake while still warm from the oven. Brush liberally with lemon simple syrup. Let cake cool for 15 minutes then invert cake out onto cooling rack. Poke holes in top of cake and brush liberally with remaining lemon simple syrup. Let cake cool completely on wire rack. Lemon Glaze: While cake is cooling on rack, in a small bowl add lemon juice by the Tablespoon full to around 1 cup of powdered sugar until a thick glaze comes together. I also added a little lemon extract for extra flavor. Drizzle the glaze over the cool cake. Let glaze set up for around 10 minutes before cutting cake. Store in a airtight container on the counter.